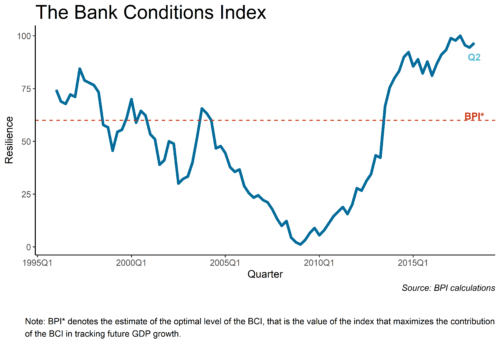 The Bank Conditions Index (BCI), which provides a summary measure of the condition of the U.S. banking system, rose in the second quarter of 2018 as shown in the chart below. The elevated values of the index show an extremely resilient U.S. banking system, reflecting in large part the very strong capital and liquidity positions of banks as well as a very prudent stance on loan originations. Over the last few quarters, the index registered modest declines in large part driven by changes to the U.S. tax code. This quarter, improvements in the BCI were widespread across almost all categories of the index. The profitability and capital categories rose mainly because of the lower corporate tax rate, and risk aversion remained somewhat elevated as shown by the negative gap between loans and GDP. Overall, the BCI remains well above the level that maximizes the contribution of the index in tracking future GDP growth, suggesting that risk-aversion by banks or banking regulations continue to be holding back economic growth somewhat. 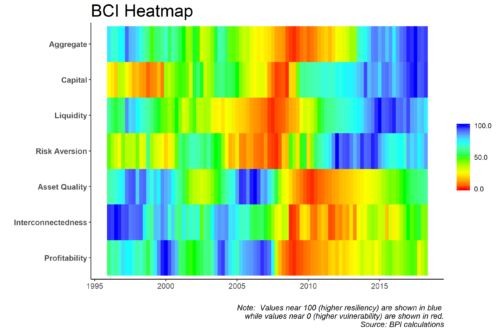 The figure below depicts the heat map of BCI for each of the six categories that comprise the aggregate index. Values near 100 (higher resiliency) are shown in blue while values near 0 (higher vulnerability) are shown in red. Overall, most of the six subcomponents of the BCI – capital, liquidity, risk-aversion, asset quality, interconnectedness and profitability – became more resilient in the second quarter of 2018. In particular, capital, risk aversion, asset quality, interconnectedness and the profitability categories showed improvements in their degree of resiliency. Only the liquidity category experienced a very modest decline in the degree of resiliency this quarter. The increase in the resiliency observed in the capital category was driven by an increase in regulatory capital ratios. Over the past couple of quarters, regulatory capital ratios declined at banks in part driven by recent changes to the U.S. tax code. 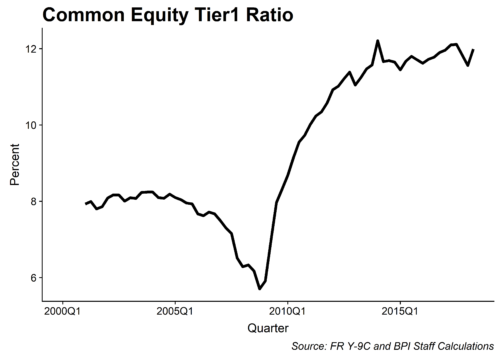 As shown in the chart below the common equity tier 1 ratio rose to 12.0 percent in the second quarter from 11.6 percent in the first quarter. The rise in regulatory capital ratios was more pronounced for risk-based ratios compared to the tier 1 leverage ratio. This suggests that the increase in resiliency in regulatory capital was driven both by an increase in retained earnings as well as a decrease in the riskiness of bank assets. There is also very little evidence of a build-up of vulnerabilities in the banking sector. Specifically, the risk aversion category also rose in the second quarter driven by a decline in the loan-to-GDP gap, shown in the top panel below. 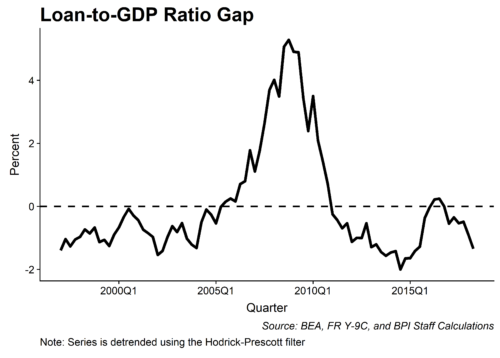 Currently, the gap is well below its long-run trend (denoted by the zero dashed line since the series is detrended) and declined further in the second quarter signaling a lackluster growth rate of loans relative to the size of the economy. The softness in bank lending appears to owe in part to substitution to the nonbank sector, including the corporate bond market, as borrowers seek to lock in low long-term rates. 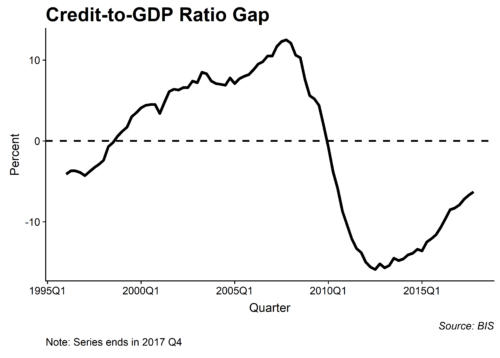 Indeed, as shown in the chart at the bottom the credit-to-GDP gap – which includes the supply of credit in the U.S. economy from both banks and nonbanks – continued to close as of the end of 2017, albeit it remains well below its long-run trend. Nonetheless, headwinds arising from tighter banking regulations have likely continued to put downward pressure on loan growth, particularly on loans to small businesses and loans to borrowers with less-than-pristine credit histories. 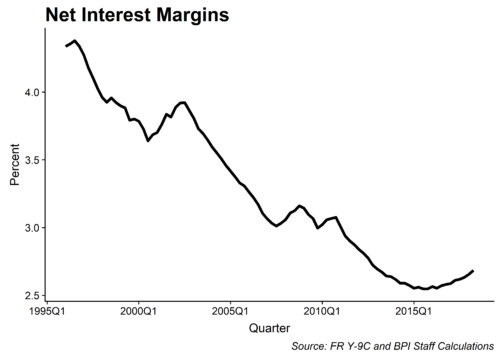 Meanwhile, bank profitability continued to recover largely because of the reduction in the corporate tax rate, and an increase in noninterest income and net interest margins (shown in the chart below), but profitability remained still somewhat subdued relative to historical standards. The improvement in the asset quality subcomponent was also widespread across all series of the index, including the ratio of net charge-offs to loans and the ratio of loan loss reserves to non-performing loans. On net, the interconnectedness category also became more resilient reflecting a lower concentration of bank assets. The decrease in resiliency observed in the liquidity category was driven by an increase in the share of liabilities financed with short-term wholesale liabilities, shown in the chart above. The increase in wholesale funding over the past year has in most part been driven by other borrowed money with maturities of less than one year. Other measures of liquidity remained roughly unchanged, namely the share of high-quality liquid assets and the gap between the maturity of assets and liabilities. Thus, despite the recent rise in short-term wholesale funding from historical low levels, U.S. banks continued to have highly liquid balance sheets and sizable liquidity buffers. The BCI was created at the end of 2016 in order to provide a quantitative assessment of the resilience of the U.S. banking sector using a wide range of common indicators of bank condition and updates the index at a quarterly frequency. The index synthesizes data on 24 banking indicators, grouped into six categories: capital, liquidity, risk-aversion, asset quality, interconnectedness and profitability. The aggregate index assesses the resilience of the banking sector from the first quarter of 1996 to the present (second quarter of 2018) on a scale of 0 to 100. A value of 100 indicates that the banking sector is at its most resilient since the first quarter of 1996; conversely, a value of 0 implies that the U.S. banking sector is at its most vulnerable. Although a value of 100 is associated with a maximally resilient banking system, it is probably not the level most conducive of robust economic growth. On the one hand, having extremely safe banks is desirable from a financial stability perspective as vulnerabilities in the banking system amplify and propagate adverse economic and financial shocks, resulting in severe and persistent economic downturns. On the other hand, a banking system that is excessively risk-averse will also have an adverse impact on economic growth over the medium and longer term by restraining credit to borrowers that are bank-dependent (e.g., small businesses) and via higher lending rates on loans to all types of borrowers. We find that GDP growth is at its highest when the BCI is about 60 (see the dashed line in the first chart). Currently the BCI is close to 100, suggesting that bank caution or banking regulations could be holding back economic growth.